PLEASE CALL THE OFFICE AT 905-339-3000 TO FIND OUT AVAILABILITY OF COURSES BEING OFFERED. Bronze Medallion you must be 13 years of age OR have Bronze Star. Bronze Cross you must have Bronze Medallion. Some classroom work and pool practice every day for both courses. 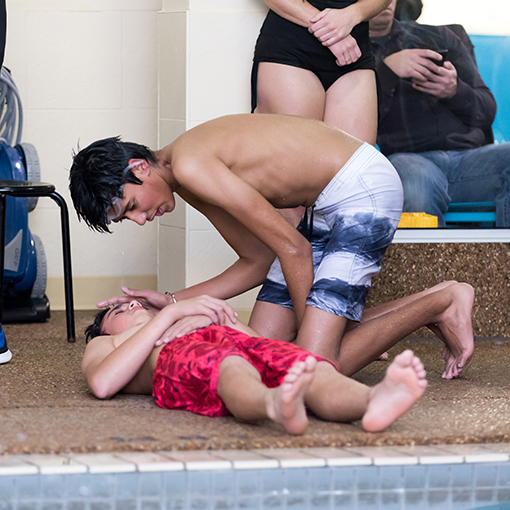 Are you interested in becoming a Lifeguard or Swim Instructor? These are the first 2 steps. We HIRE many staff from within our Bronze Cross courses as assistants in our facility. LSS Assistant Instructors Prerequisites: 14 years of age by the end of the course; Bronze Cross or higher certification (need not be current). LSS Instructors Prerequisites: 16 years of age by the end of the course; Bronze Cross certification (need not be current). We HIRE many staff from within our Assistant and Swim Instructors courses as instructors in our facility. *Price does not include materials needed however can be purchased at The Swim Academy.